SWD Inc. Fastener Sorting Corporation - Specializing in Black Oxide, Passivation, Phosphating, Dip Spin Coatings, and Fastener Sorting. SWD Inc. is Chicagoland’s premier metal finishing, dip spin coatings, and fastener sorting facility. We specialize in working with stampings and fasteners such as screws, nuts, bolts, and washers. SWD Inc. is located less than 30 minutes from Chicago, Illinois. SWD Inc. has created a tradition of exceptional production quality, complete customer satisfaction, and continuing commitment to environmental conservation. 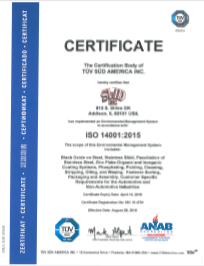 SWD Inc. was the first metal finishing and fastener sorting company in the U.S. to receive ISO 14001 certification. SWD Inc. is the largest Black Oxide shop in the Continental United States. We have specialized in Black Oxide for over Twenty Five years. Other names for Black Oxide are: Black Penetrate, Black Magic, Black N, and Gun Bluing. SWD Inc. takes pride in our accreditations and continually revises our management systems to meet the goals and best case practices set forth in ISO 9001:2015, ISO 14001:2015 and ISO 17025 to help us better meet and exceed industry standards.